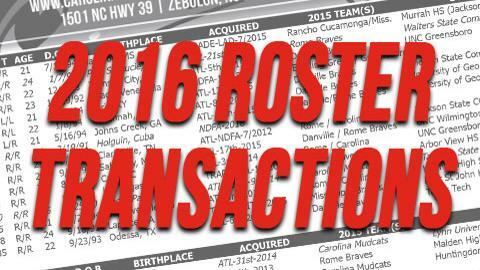 ZEBULON, NC - The Atlanta Braves announced several player transactions today with three affecting the Carolina Mudcats active roster. The roster moves included the assignment of INF Travis Demeritte to the Mudcats, the transfer of LHP Phil Pfeifer from Carolina to Mississippi and the release of OF Joseph Daris from the organization. Demeritte, 21, was recently acquired in a trade between the Atlanta Braves and Texas Rangers on July 27 and previously spent his 2016 season in the California League with the High Desert Mavericks. Demeritte was batting .272/.352/.583 with 90 hits, a California League high 25 home runs and 59 RBI before the trade. He also led the California League in slugging percentage (.583), extra-base hits (49), total bases (193) and strikeouts (125) before the trade. Pfeifer, 24, collected two saves and pitched to a 2.57 ERA over six games (7.0 IP, 3 H, 2 R, 4 BB, 10 SO) with the Mudcats before his promotion to Double-A Mississippi. Like Demeritte, Pfeifer was also acquired in a recent trade between the Braves and Los Angeles Dodgers (June 30). Daris, 24, was batting .226/.298/.322 with 13 doubles, two triples and two home runs over 74 games with the Mudcats before his release from the Atlanta organization. He had also hit safely in each of his last seven games. The Mudcats roster is currently at 24 active players with six on the disabled list and one on the temporary inactive list.